Poring over newly-arrived seed catalogs is an excellent way to combat the "blahs" brought on by a dreary February day. There is nothing like the anticipation of the coming growing season to bolster morale. Each year brings with it an abundance of new choices for the garden–some probably better suited to our climate than others. Listed below are a number of new flower cultivars for 2017 that should perform well under Missouri conditions. Angelonia 'Archangel Cherry Red' (Angelonia angustifoliua). The 'Archangel' series of angelonia has huge flowers which are vibrant against its glossy, dark green foliage. 'Cherry Red' thrives in extreme heat, humidity and drought, yet keeps a delicate appearance in the garden. It is excellent as a landscape performer or mixed in larger containers as a "thriller". Begonia 'Megawatt' (Begonia interspecific). 'Megawatt' is easy-to-grow and powers through humidity and heat. It tolerates dry periods between watering, too. An outstanding performer, it flowers continuously from late-spring through fall. Plant it in large-size containers or in the landscape for fast-fill. Its striking flowers cover the plant, sitting above sturdy flower stems for superior show. Begonia 'Funky™ Pink' (Begonia hybrida). Able to handle full sun in most climates, 'Funky™ Pink' is a breakthrough in tuberous begonia breeding. Its unique "shredded" double flowers provide outstanding color and texture in hanging baskets, patio pots, or even in garden beds. 'Funky™ Pink' also has superior outdoor performance, and is drought-tolerant once established. Begonia 'Santa Barbara'™ (Begonia hybrida). As beautiful and elegant as the city it's named after, 'Santa Barbara' has huge 2-inch clean white flowers for an elegant, tropical look. It exhibits outstanding weather and drought tolerance, is easy to grow and has extraordinary performance in hanging baskets, containers and garden beds. In most climates 'Santa Barbara' can be grown in full sun. However, shade during the hottest weeks of the summer is helpful. Begonia 'Topspin'™ (Begonia semperflorens). 'Topspin'™ begonia is a great addition to any garden. It tends to tolerate cool temperatures and is ideal for early spring through summer seasons. This begonia is great in containers or for low edging areas of a shade garden. Begonia 'Unbelievable Miss Montreal' (Begonia hybrida). Named in part for its cold tolerance, and in part for its classic beauty, 'Unbelievable Miss Montreal' features a compact mounding growth habit that is perfect for containers, hanging baskets, and even landscape plantings. Self-cleaning and low-maintenance, the gorgeous coral and white blooms create an irresistible contrast over deep green and bronze foliage. Bidens 'Bee Alive' (Bidens ferulifolia). Bidens is excellent for attracting pollinators, such as bees and butterflies. 'Bee Alive' comes in an eye-catching novelty color that works great in combination containers as well as in beds and borders. Calibrachoa 'Aloha Nani Golden Girl' (Calibrachoa hybrida). Calibrachoa 'Aloha Nani Golden Girl' is one of the boldest gold flowers on the market. The 'Aloha Nani' series consists of six compact calibrachoa selections that are very versatile. They can be used in combination planters, containers and hanging baskets. Featuring an abundant quantity of oversized flowers in bold colors, the flower-power of the 'Aloha Nani' series is truly remarkable. Calibrachoa 'Paradise Island Fuseables'® F1 (Calibrachoa hybrida). 'Fuseables'® contains several varieties in one multi-seed pellet. 'Paradise Island' consists of 'Calibrachoa KaBloom'™ yellow, denim and rose, which cannot be purchased separately. Ideal for color bowls, baskets and large patio containers, 'Paradise Island' represents the first calibrachoa available from seeds. Celosia 'Asian Garden' (Celosia argentea). 'Asian Garden' exhibits outstanding branching habit with continual bloom. It can be used as a knee-high garden plant, container plant, fresh cut-flower and dried flower. A pollinator magnet, it tolerates heat, high humidity and diseases. (2017 AAS winner). Celosia 'Dracula' (Celosia cristata). 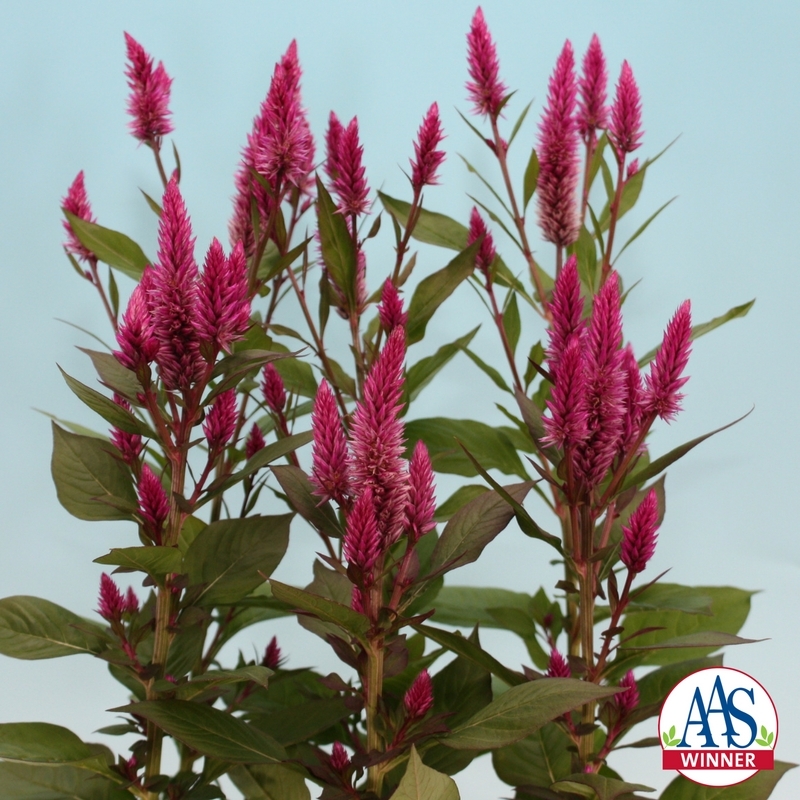 'Dracula' is a novelty, first-of-its-kind celosia that bears dark-red flowers atop purple-bronze foliage. Its unusual shape and eye-catching color adds drama to landscapes and containers. Coleus 'French Quarter' (Solenostemon scutellarioides). This coleus looks great in the sun or shade. Its stunning colors and patterns hold in either exposure. 'French Quarter' is a versatile, premium variety that is very late to never-flowering. This low-maintenance, high-impact plant is perfect for large-size containers and back-border landscaping. Coleus 'Pineapple Surprise' (Solenostemon scutellarioides). The unique and versatile tricolor pattern of 'Pineapple Surprise' features leaves that are an iridescent chartreuse in color with deep burgundy hearts splashed with green. Very late-flowering, use this variety for long lasting performance in the garden. Also, it holds up very well in extreme weather. Coleus 'Fancy Feathers Copper' (Solenostemon scutellarioides). 'Fancy Feathers™ Copper' is one of the most unique coleus ever introduced. It has long feathery, multi-colored leaves which are layered in a tufted formation. This coleus displays a beautiful range of colors from copper and persimmon to magenta. Eye-catching as a specimen, it has a compact, dwarf growth habit and works equally well in small containers or at the front of a border garden. Coleus 'Main Street Michigan Avenue' (Solenostemon scutellarioides). A contemporary take on a popular classic, 'Main Street Michigan Avenue' will hold its color even under high light conditions. The late-season flowering of the 'Main Street' series allows the variegated foliage to remain center stage throughout the growing season. Uniform and easy-to-grow, this textured masterpiece performs equally well in sun or shade, a fact that any gardener is sure to appreciate. It's the perfect foliage complement to other plants in the landscape. Cosmos 'Cupcakes' (Cosmos bipinnatus). Fused petals form deep cups on this amazing new cosmos, discovered by a gardener in California. A mix of semi-double and single blooms in white, light pink, and dark pink adorn the plants. The flowers are great for cutting and the bushy plants stand up well to heat, rain and drought. Plants can reach 48 inches in height and bloom summer through fall. Cosmos 'Xanthos' (Cosmos bipinnatus). The first true yellow cosmos has arrived. Early flowering with 2½ inch soft-yellow blooms, 'Xanthos' displays a compact yet well-branched growth habit. This novelty cosmos can be merchandised as a top attraction for borders, beds, patio containers and cut flowers. Dahlia 'Fired Up' (Dahlia pinnata). This new dahlia is sure to attract lots of attention in your summer garden. "Fired Up's" enormous, red-orange flowers have luminous yellow centers and measure up to seven inches across. The blossoms have quilled and twisted petals, which gives them extra texture and a casual charm. Plant this dahlia in a prominent spot and let your friends and neighbors enjoy the show. Dahlia 'Magic Sunrise' (Dahlia pinnata). 'Magic Sunrise' is a bright, flamingo-pink dahlia with a glowing yellow center. The sturdy, 3-4 foot plants produce a non-stop supply of big, 6-inch flowers, ensuring months of beautiful bouquets. 'Magic Sunrise' is a great choice for planting at the back of a perennial border, because the colors work so well with other late summer flowers such as purple coneflower, sedum and phlox. Gazania 'Enorma' series (Gazania rigens). 'Enorma' is a new series of gazania that comes in six colors: vanilla, yellow, yellow with ring, orange, orange with ring and red with ring. Heat and drought tolerant, and bred for large flower size, it has glossy, dark green leaves which are more disease resistant during periods of wet weather than most other gazanias. Geranium 'Savannah Cerise Sizzle' (Pelargonium x hortorum). 'Savannah Cerise Sizzle' features dark foliage, medium vigor, and the best heat and humidity tolerance of zonal geraniums on the market. Vibrant blooms atop well-branched geranium foliage make this an eye-popping display perfect for high-traffic areas, window boxes or patio containers. Gerbera 'Revolution Red Lemon' (Gerbera jamesonii). 'Revolution' gerbera are a great gift plant or an indoor potted plant to enjoy in your home décor our patio space. The bicolored 'Red Lemon' is attractive with its daisy-like, mid-size flowers borne on compact stems with dark green leaves. Remove spent flowers and fertilize to encourage reblooming. Mandevilla 'Sun Parasol® Apricot' (Mandevilla hybrida). Apricot is a breakthrough color in the 'Sun Parasol' mandevilla series. It offers a pastel option that works with softer color schemes. Flowers are large like the 'Sun Parasol Giant' varieties, often spanning 3-5 inches. Flowers have a darker orange ring in the center and soft peach petals. It loves hot weather and has a gorgeous trailing growth habit. This makes it perfect for large hanging baskets or for climbing up trellises. Marigold 'Fireball' (Tagetes patula). 'Fireball' flowers open red, then turn to fiery bronze and dark gold as they mature, producing a multicolored display on one plant. It's perfect in containers or makes a brazen color show in beds and borders. Like all marigolds, it loves sun and heat. New Guinea Impatiens 'SunStanding Purple' (Impatiens hybrid). 'SunStanding Purple' New Guinea impatiens sports very bright purple flowers over glossy green and bronze foliage. The entire 'SunStanding' series is both striking and sturdy. They thrive in most garden conditions, tolerating the sun quite well. The 'SunStanding' series is naturally compact and uniform, making them ideal for combos or mass plantings. At home in containers or the landscape, in the sun or the shade, 'SunStanding' are outstanding anywhere. Nicotiana 'Garnet Gem'® (Nicotiana hybrida). 'Garnet Gem'® flowering tobacco produces showers of starry, red flowers that are trumpet-shaped. Their long tubes swell into a bell-like shape below the flared petals. The reverse of the blooms often shows bright green coloring or stripes of red and green. This new introduction is showy and well branched, resulting in flowers that completely cover the plant. A natural cross of two Nicotiana species, it shows some variability in color and bloom size, but is lovely and unique. Ornamental Pepper 'Hot Pops Purple' (Capsicum annuum). 'Hot Pops Purple' produces colorful little round pepper fruits that are attractive, but are not for eating. They start orange and mature to purple for multiple colors on the same plant. It's heat tolerant and extends its color well into the fall, for added appeal. Pentas 'BeeBright'™ (Pentas lanceolate). 'BeeBright'™ is great for attracting pollinators such as bees and butterflies to the garden. It produces vibrant color that will brighten any garden. This new variety is drought tolerant and low maintenance. Petunia 'Amore™ Queen of Hearts' (Petunia x hybrida). This amazing new petunia series is decorated with beautiful heart shapes on every flower, spreading a message of love and friendship in the garden. With its lengthy flowering period and a strong and uniform semi-trailing habit, it is a fabulous choice for pots, hanging baskets or mixed containers. Petunia 'Laura Bush Blend' (Petunia x violacea). This old-fashioned petunia is "Texas tough." Bred for heat tolerance and disease resistance, it is a low-maintenance beauty. Named after former First Lady Laura Bush, this variety boasts a classic petunia fragrance. It has a spreading growth habit and is available in a mix of magenta, purple, pink, and white blooms. Use 'Laura Bush Blend' in containers for a lush patio garden–even in the high heat of summer. Petunia 'Success!® Pink Vein' (Petunia x hybrida). Make your own success story with the newest color in this easy-to-grow trailing petunia series. The color and performance of 'SUCCESS!® Pink Vein' are unparalleled. It creates mounds of vibrant color in hanging baskets, patio pots or garden beds. The perfectly shaped flowers hold up in the rain or sun and won't break open in the middle. It produces color so bold you will find it irresistible. Petunia 'Surfinia® Heartbeat' (Petunia x hybrida). 'Surfinia® Heartbeat' exhibits compact growth that is both mounded as well as trailing. Fast-growing and self-cleaning, it displays excellent rain tolerance and is ideal for full sun or part-shade. 'Surfinia® Heartbeat' is a good choice for patio containers, hanging baskets, window boxes and garden beds and borders. Petunia 'Sweetunia Suzie Storm' (Petunia x hybrida). 'Suzie Storm' joins the 'Sweetunia' series of petunia which is renowned for a broad color range and unique novelties. Its blooms are subtly-veined, deep plum in color and outlined with cheerful raspberry for an eye-popping display. 'Sweetuina Suzie Storm' works well in containers and hanging baskets, thanks to its mid-range vigor, upright-mounding habit and floriferous bloom set. Sunflower 'Early Black Heart F1' (Helianthus annuus). This new sunflower boasts 7-8 inch flowers with black "faces". Maturing in only 55 days from direct sowing, transplanting is not recommended. Its stunning color combination of dark faces with pale orange petals make it a garden standout. It produces no pollen and grows to 5-6 feet in height. Verbena 'EnduraScape™ Pink Bicolor' (Verbena peruviana). 'EnduraScape' is tough as nails. It is the first verbena that can take the hottest days of summer but is cold-hardy down to the low teens. 'Pink Bicolor' is the newest color in the series and truly is spectacular in the ground or in large baskets. Vinca 'Mega Bloom Orchid Halo F1' & 'Mega Bloom Pink Halo F1' (Catharanthus roseus). The 'Mega Bloom' series was bred for outstanding garden performance along with disease resistance. The series boasts very beautiful, soft-colored flowers which are held atop vigorous plants. Like all vinca, the 'Mega Bloom' series is very heat tolerant. Vinca 'Solar Avalanche F1' series (Catharanthus roseus). The new F1 'Solar Avalanche' series of trailing vinca is comprised of seven separate colors - apricot, burgundy, pink, rose, red, violet and white - plus a complete formula mixture. 'Solar Avalanche' vinca are very floriferous, and the series was bred for having larger, rounded flowers with overlapping petals, from the first blooms produced. Outstanding in baskets, 'Solar Avalanche' makes a great landscape annual as it covers large areas with bloom. Also, it makes a great "spiller" component for patio containers. Zinnia 'Profusion Red' (Zinnia hybrid). The first true-red zinnia in its class, 'Profusion Red' has been named a 2017 All-America Selections Winner. The 'Profusion' series' uniformity and disease resistance is well- known, and 'Profusion Red' fits right in. 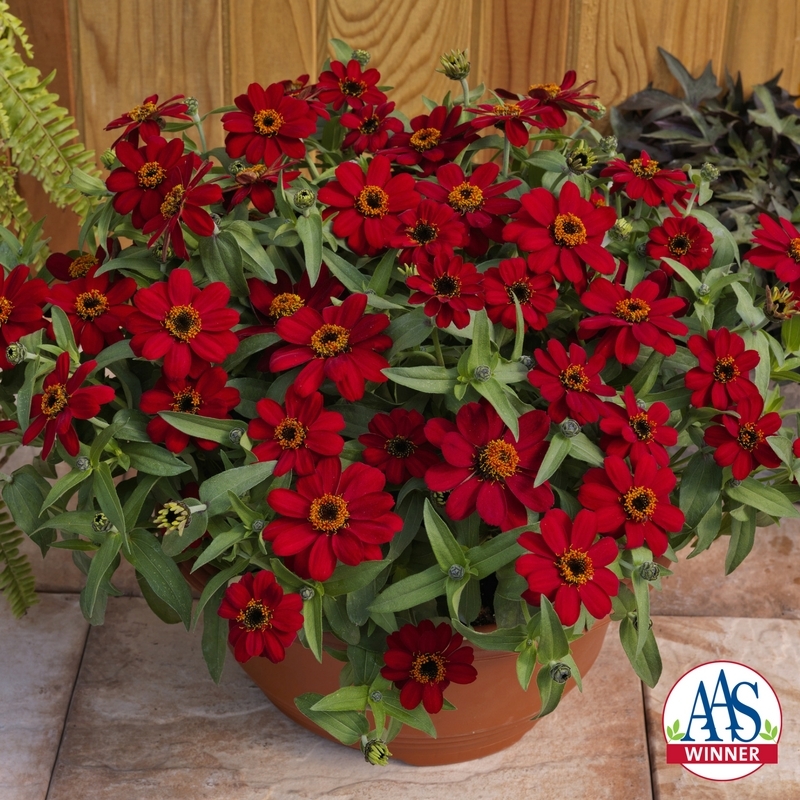 This award winner features rich red, single-petaled blooms and flowers continuously from spring through frost. The bright color does not fade, even under high temperatures. 'Profusion Red' is easy to grow since it is self-cleaning, disease resistant and does well in a wide range of climates. The flowers can grow 2½ inches in diameter; plants grow 8-14 inches tall and 24 inches wide. Zinnia 'Queen Lime with Blush' (Zinnia elegans). 'Lime with Blush' displays sophisticated color combinations and is an innovative, elegant addition to the 'Queen' series. It produces mostly double and semi-double 2-3½ inch blooms with a small percentage of singles. It's not very often that a new color is added to this classic cut flower. Also known as 'Queen Lime with Blotch' it displays excellent garden performance and grows to a height of 30-40 inches.